This year's Elvis week auction will offer amazing artifacts from both Elvis’ theatrical and musical careers as well as remarkable personal tokens and gifts. Also starring in this auction are Elvis’ original birth record, never-before-seen concert footage, J.D. 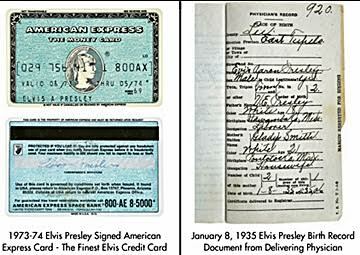 Sumner’s TCB Necklace, an outstanding photo archive collection and Elvis’ own personal American Express card!